On Sunday, 18 local private and Catholic schools attended the Neumann Catholic Swim League Annual Championship Meet. 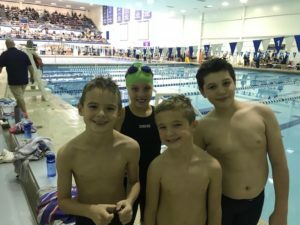 The meet was broken out into 3 sessions, 8 and under, 9 and 10 year olds and 11 and older. It was a long fun day filled with some amazing swimming! 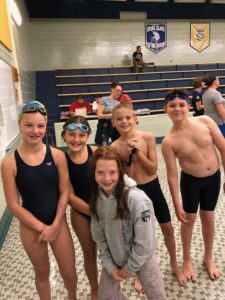 Our little Knight Swimmers Fiona L, Josey L, Quinn M, Trevor T and Alyssa Z swam hard and had some great times with Josey winning her heat in one of her events. Next up we had the 9-10 year old’s Brianna A, Thomas B, Bridget G, Julian H, Kennedy M, Emma P, Aniella P Tanner T and Tyler T who all had some great times. Brianna A earned an All-Star time in the 50 free and Aniella P earned it in the 50 back. Tyler T won his heat in his event. The Freestyle Relay team of Thomas B, Aniella P, Tyler T and Brianna A finished 15th place overall and will each be receiving a ribbon for their strong finish. 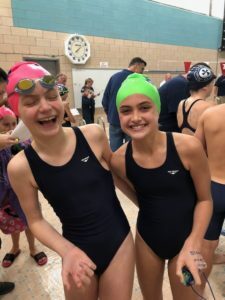 In the 11 and over session, SSPP was well represented with swimmers Gabby A, Quinn F, Kennedy K, Macey K, Cara M, Cassidy M, Victoria N and Isabella P. The session started off with Gabby A taking the 1st place Gold Medal in the 200 Freestyle. 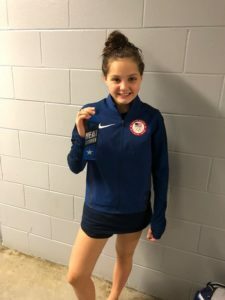 She followed up that win with a Silver Medal in the 50 Fly. Gabby has also earned Elite All-Star by obtaining All-Star Times in all events. Swimmer Quinn F earned an All-Star time in the 50 Free, Cara M earned it in both the 50 back and 100 free and Isabella P earned it in the 50 free. The medley relay team of Cara, Macey, Gabby and Isabella finished 13th overall and will each be receiving a ribbon. 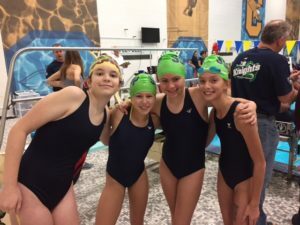 The freestyle relay team of Cassidy, Kennedy, Victoria and Macey won their heat and the freestyle relay team of Isabella, Cara, Quinn and Gabby finished 13th overall and will also be receiving a ribbon for their great finish. 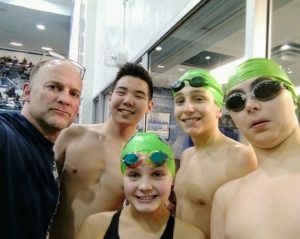 The SSPP Swim Team finished the overall season in 2nd place! Our 8th grade swimmers helped make that possible. Amelia, Kennedy, Victoria and Elizabeth stepped up and joined the swim team which gave us a fighting chance. 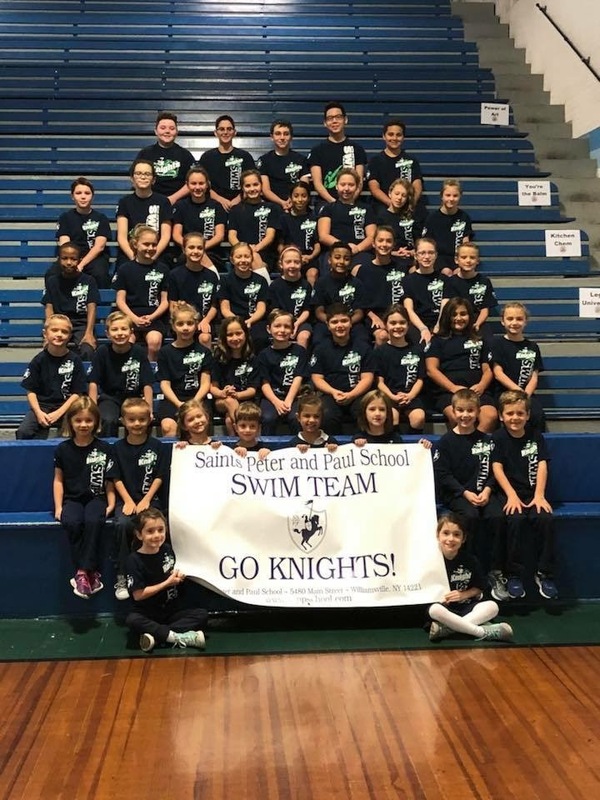 Although swimming isn’t their favorite sport – they were true SSPP KNIGHTS and joined the swim team. They each showed huge improvements and they can retire their swimsuits knowing they made their parents and coaches proud for being true team players. A special THANK YOU to our dedicated coaches Summer Przybylak and Don Adamczyk and Swim Directors Suzanne Marchese and Andrea Tevens for their time and dedication to our swim team. Look for more information this spring on how you can join the SSPP Swim Team next fall! 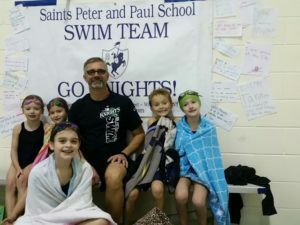 The SSPP Knights fought a tough battle but it seems a night of kicking up their heels at the SSPP Halloween party the night before, left many of our swimmers a tad tired. 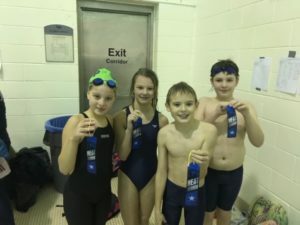 The 9-10 Medley Relay team of Tyler T, Tanner T, Brianna A and Aniella P finished 1st place. Evie W swam her first meet yesterday did awesome! Although we lost our first meet on Sunday, our SSPP Knights showed great sportsmanship throughout the meet. 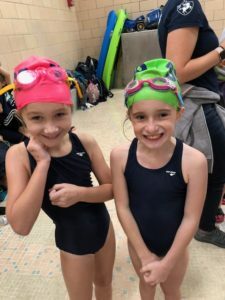 Our swimmers continue to improve each week which is a win to our coaches! Join us for our final regular season meet next Sunday 11/4 as we take on Christ the King! 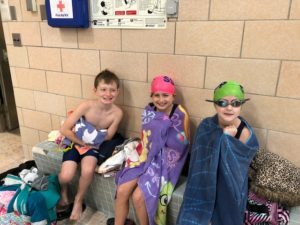 The SSPP swimmers were back at it bright and early Sunday morning. The results were much better than our Buffalo Bills – we won the meet! It was a nail biter – we won by 3 points. The win came from the hard work of all our swimmers and the diligent work of our coaches and directors. Putting together the line up’s each week is a daunting task! The best part of the swim meet isn’t necessarily the win itself… it’s watching all the incredible things that happen on deck during the meet. The older kids “coaching” the younger swimmers. All the kids cheering for their teammates. The teammates supporting each other when they are a little intimidated by their next swim. 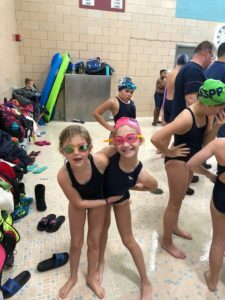 Our SSPP Swim Team is a great reflection of our school. The undefeated swim team will take on the competitive DeSales team next Sunday morning at 11:30 am at Tonawanda City High School. Please join us and cheer on our swim team! 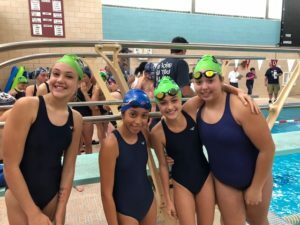 Victory again for the SSPP Swim Team! 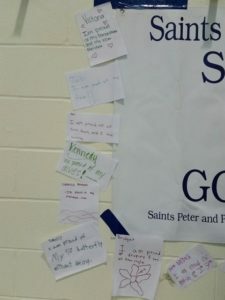 The SSPP swim team won their 2nd meet in a row against St. Peter RC School on Sunday. It was an early morning start, but our swimmers came ready to compete. Cara M came in 1st place in the 200 yard Freestyle also earning an All-Star Time. 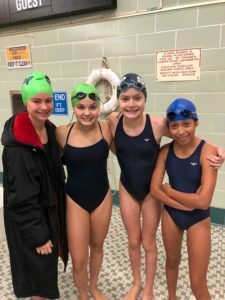 The 11 and Up Medley Relay team also finished 1st – Amelia M, Isabella P, Gabby A and Cara M.
Alyssa Z finished 1st place in the 100 IM – which was also the first time she swam it for the 8U team. Brianna A took 1st place in the 100 IM for the 9&10 team and Gabby A took 1st place in the 200 IM for the 11&UP also earning an All-Star Time. Trevor T took 1st place in the 25 yard freestyle and one of our younger swimmers Quinn M took 3rd place. Thomas B finished 1st in the 50 yard freestyle and Brianna A took 3rd place. Amelia M took 2nd place in the 50 yard freestyle and Cassidy took 3rd place. Gabby A also earned an All-Star time in the 50 free. Alyssa Z took 1st place in the 25 yard butterfly and also earned an All-Star time! Thomas B took 2nd place in the 50 butterfly which was also his first time swimming that event. Cara M earned a 1st place finish in the 50 butterfly and Cassidy M took 3rd place. In the 8U 50 freestyle Alyssa Z finished 2nd place and Josey L finished 3rd. 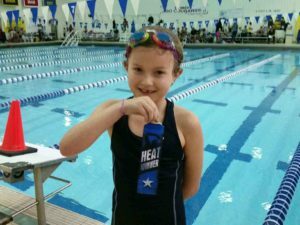 Aniella P finished 1st in the 9-10 100 yard freestyle and Isabella P finished 1st for the 11U team. In the 8U 25 back, Thomas G finished 2nd place and Quinn M finished 3rd place. They 9-10 year olds kept up the pace with Tyler T taking 1st place and Bridget G taking 2nd place in the 50 back. In the 11U 50 back Gabby A took 1st place (also earning an All-Star time) and Victoria N took 3rd place. Fiona L took 2nd place in the 25 yard breaststroke. 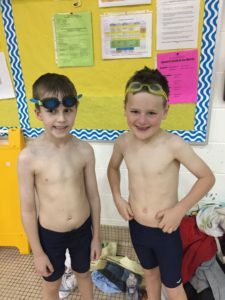 Tanner T took 1st place and Julian H took 2nd place in the 50 yard breaststroke for the 9-10 year olds. Amelia M finished 1st and Victoria N finished 2nd in the 50 breaststroke for the 11U’s. 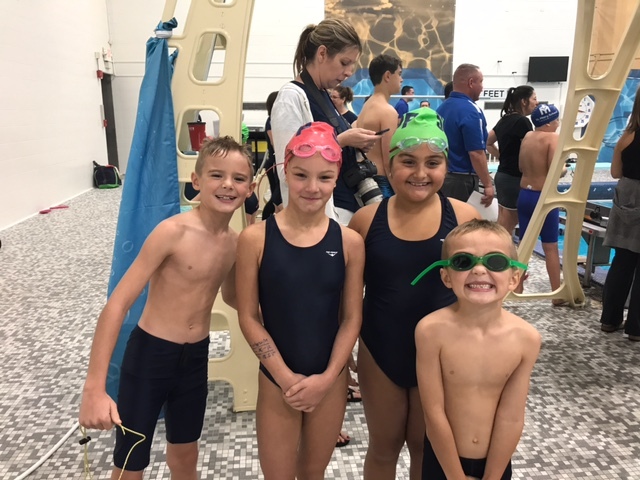 We wrapped up the meet with our 8U’s freestyle relay team taking 2nd (Alyssa Z, Fiona L, Josey L and Thomas G) – our 9-10 freestyle team took 2nd (Thomas B, Tyler T, Emma P and Aniella P) and 3rd (Tanner T, Julian H, Bridget G and Owen N) and our 11U freestyle took 1st place (Gabby A, Isabella P, Cassidy M and Cara M). Although we were missing several swimmers from each age group, the team pulled together for the win. What is more impressive than the win, was the sportsmanship our SSPP athletes showed. Our SSPP swimmers are a great representation of our school! 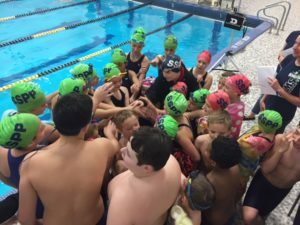 Please join us to cheer on the SSPP swimmers next Sunday 10/21 at 8:30 am as we take on St. Andrew’s at Kenmore East High School! Go KNIGHTS! Swimming is a great lifelong sport. Swimming provides an awesome conditioning exercise for any sport your child choses to pursue and pulls kids away from the screens! One of the greatest comforts for a parent is to have a child who is a strong swimmer. Last year over 20% of our students participated on swim team (with a huge number of K-2nd graders). We provide a nurturing and competitive team environment. It is one of the few school sports that is open to children from K-8th grade. 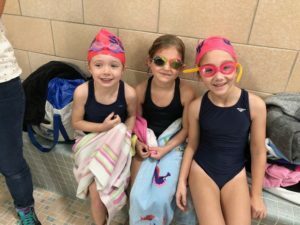 Swim team is a perfect place for both kids and parents to meet new families and make new friends. The swim team is divided into three groups: children 8 and under, children 9 and 10, and children 11 and older. The group your child belongs in will be based on their age as of September 1st. How often is practice and what is the attendance expectation? The team practices twice a week for one hour each session. This year our practices will be at Williamsville East HS on Monday’s and Thursday evenings. The younger kids will practice from 7-8 and the older ones from 8-9. We encourage children to attend as many practices as possible. However, we do understand it is an intense season and that families have many additional commitments. Children are never penalized for missed practices. A complete schedule is provided below. When and where are the swim meets? 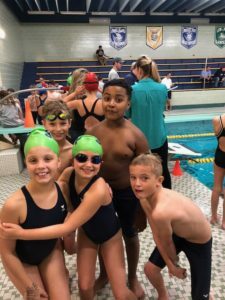 SSPP participates in the Neumann Catholic Swim League (www.ncsl-buffalo.org). We swim against other Catholic and private schools. There are 6 meets all held on Sunday mornings at various local pools. Meets last approximately 2.5 hours and all children participate in at least 3 events. There is an optional championship for all schools held at UB on November 13th. Our first swim meet will be on September 23rd. Running a swim meet takes a village. 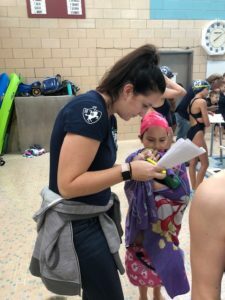 Parents are assigned various duties at every swim meet. These duties do not preclude you from watching your children swim. Working a meet actually is better than sitting in the stands (trust us)! We also welcome parents with and without swim experience to help on deck at practices. Our coaches will determine the level of parental help they require. What does the team wear? Children may wear any swim suit to swim practice (no bikinis). Our team suits are navy blue. You may purchase a navy blue suit at any store of your choice. For your convenience, a representative from Laux’s Sporting Goods will be at an upcoming practice in early September. You can have your child measured and purchase a suit and goggles at this time. 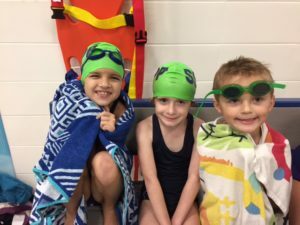 Swim caps are provided by SSPP. Girls are required to wear caps (it is optional for boys). Please contact Mrs. Christina Zogaria, SSPP Athletic Director at czogaria@ssppschool.com for registration materials. Our swim practices are held at Williamsville East High School. There must be 2 certified, CPR trained lifeguards at every practice. Our swim meet schedule is as follows, I will forward you times of the meets when I receive them. 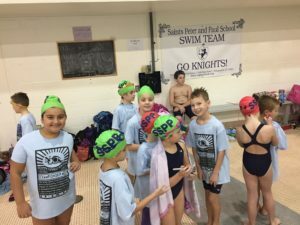 SSPP had a very strong showing at the Neumann Catholic Championship Swim Meet this past Sunday. Twenty schools participated in the final meet of the season. We are so proud of all the children and the progress they all made this season. We are blessed to have such a great group or children and parents! 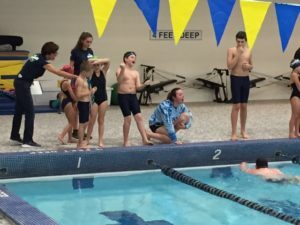 Sunday, the SSPP Swim team ended the season with a win against the Elmwood-Nichols team! All 3 age levels won which was a great way to end the season. 100 Medley Relay Team: Aniella P, Tanner T, Brianna A and Thomas B. 200 Medley Relay Team: Tyler T, Macey K, Cara M and Morgan M.
200 Medley Relay Team: Phillip A, Aaron R, Gabby A and Henry W.
100 Free Relay Team: Thomas B, Emily M, Kennedy M and Brianna A. 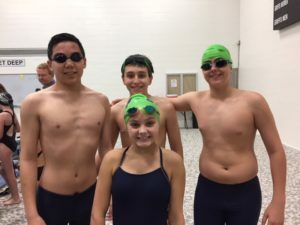 200 Free Relay Team: Cara M, Tyler T, Macey K and Morgan M.
Congratulations to our 8th grade swimmers, Phillip A, Dillion C, Andrew M, Aaron R and Henry W! The 8th graders did a great job this year and were great teammates to the SSPP younger swimmers. We wish them the best of luck! This Sunday also ended an era for our swim team coordinator, Rebecca Weimer. Mrs. Weimer has been involved with the swim team for the past 16 years. She’s lead our SSPP swimmers to many victories and inspired many kids to love the sport of swim. Her dedication and hard work have been greatly appreciated by all of swimmers and parents. Thank you Mrs. Weimer – you will be missed! Next Sunday (11/12/17) most of the SSPP swimmers will participate in the Neumann Championship Meet at UB. 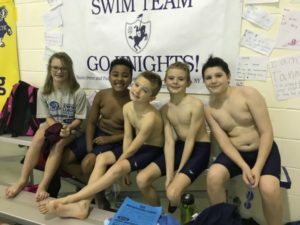 Please wish them luck as they swim against the 17 other Catholic schools in the area. The SSPP swim team had another super close meet against Nardin and although we had a strong showing, we lost meet by 4 points. 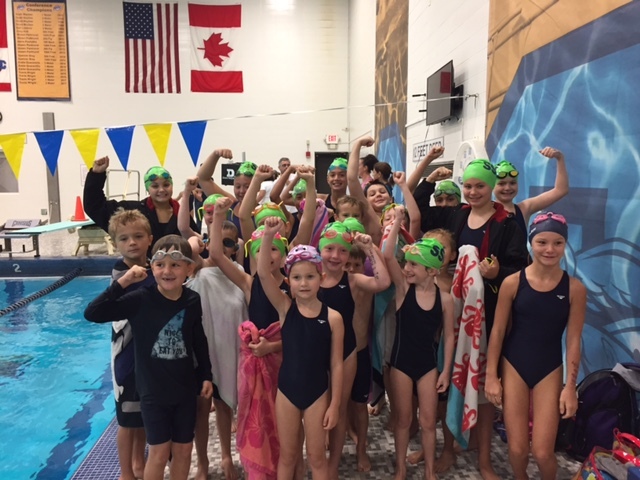 Our 8 and unders had another strong day winning their portion of the meet. Our 9/10’s were super competitive – losing by 8pts and our 11 ups missed the mark by 2 points…. You don’t get much closer than that! 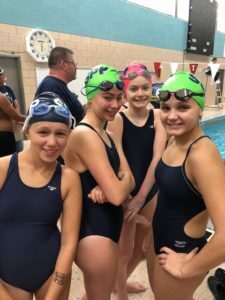 9-10 Medley Relay Team: Tyler T, Macey K, Cara M and Morgan M.
11 & Up Medley Relay Team: Phillip A, Aaron R, Gabby A, Henry W.
Please join us for our final regular meet of the season on Sunday, November 5th at 8:00 am at Canisius College as we take on Elmwood Franklin/Nichols. 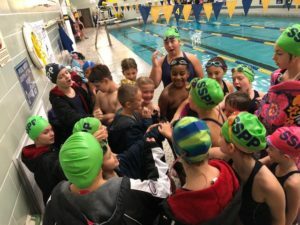 The SSPP Swim Team had a little bit of a heartbreaker Sunday as they narrowly lost against St. Mary’s of Swormville. Congratulations to our 11 ups who won their division convincingly with first place finishes in almost every event. 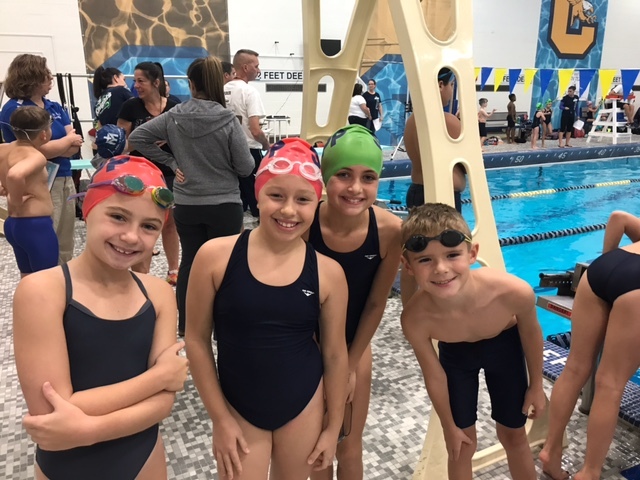 Missing a few strong swimmers in our 8 and under and 9-10 groups, they fought with great effort, but unfortunately we were just outmanned. We had a lot of great swims. Congratulations to Henry W who after 3 years of trying, finally achieved All-Star time in the 50 Breaststroke. There is always a victory somewhere at a swim meet – you just have to look! 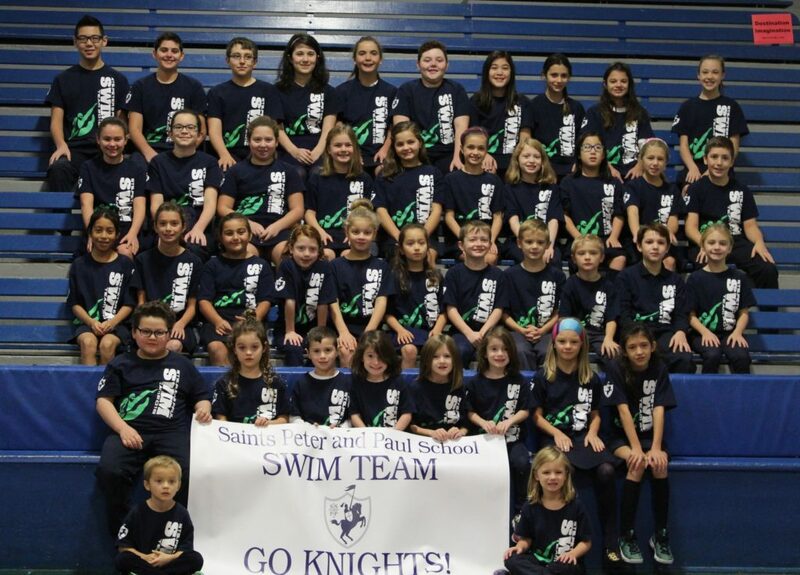 Please join us next Sunday (10/29) at 11 am to cheer on the SSPP Swim Knights as we take on Nardin at Canisius College! 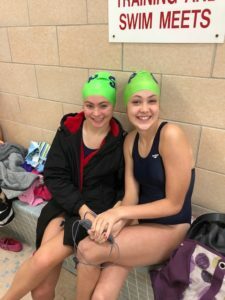 Our SSPP Swim team fought a hard battle against Stella Niagara yesterday. Although our 8 and under swimmers won their battle, Stella beat out our 9-10 and 11 and up groups. Although we did not win the meet, we had a lot of great swims. Our team continues to show improvements and more importantly, great teamwork and sportsmanship. 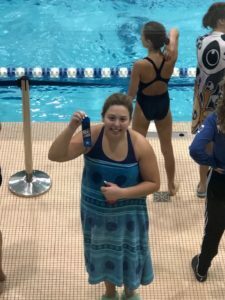 50 Free – Henry W.
50 Butterfly – Gabby A. 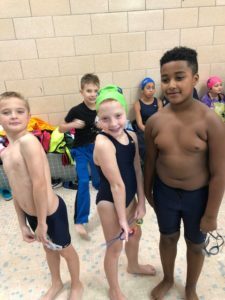 25 Backstroke – Aniella P.
50 Backstroke – Tyler T.
50 Backstroke – Philip A. 25 Breaststroke – Tanner T.
The team has a by-week this weekend, but join us as we take on DeSales school on Sunday, October 15th at 8 am at Canisius College! Congratulations to our SSPP Swim team who defeated St. Ben’s yesterday on their first meet of the season. It was a tough fight but our swimmers held their own and started the season with some great times! 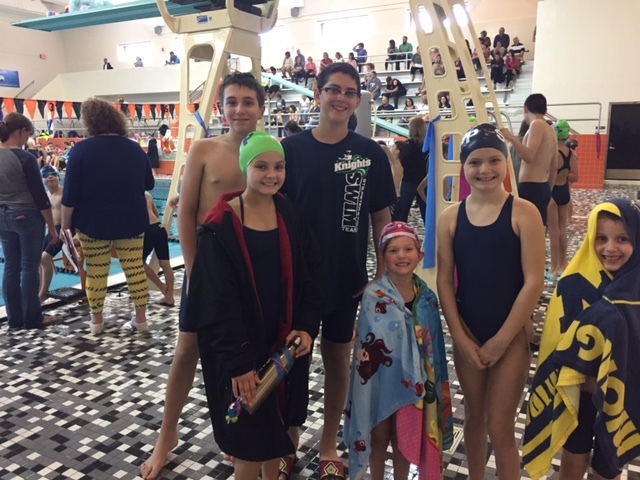 200 Medley relay team 11&Over – Philip A, Aaron R, Gabby A & Henry W.
200 free relay team 9-10 – Macey K, Tyler T, Jude V & Cara M.
Our team had an impressive amount of swimmers who accomplished All-Star Times! The SSPP Swim Team showed great sportsmanship and leadership throughout the meet. 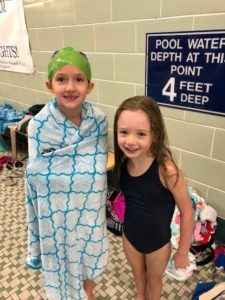 The older experienced SSPP swimmers guided the younger swimmers and made it a positive experience for everyone! We couldn’t be more proud of our team! Please join us next Sunday, October 1st at 11:30 AM at Buffalo State College as we take on the fiercely competitive team of Stella Niagara! 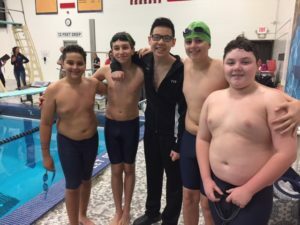 The SSPP Swim Team finished up their season this past Sunday at the Neumann Catholic Championship Meet. Our swimmers did a great job competing against all of the other Catholic and private schools in the area. There were well over 500 swimmers overall at this competitive year end meet. Swimming is a great lifelong sport. Swimming provides an awesome conditioning exercise for any sports your child choses to pursue and pulls kids away from the screens! One of the greatest comforts for a parent is to have a child who is a strong swimmer. Last year over 20% of our students participated on swim team (with a huge number of K-2nd graders). We provide a nurturing and competitive team environment. It is one of the few school sports that is open to children from K-8th grade. 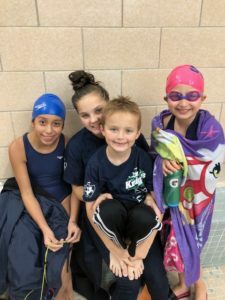 Swim team is a perfect place for both kids and parents to meet new families and make new friends. Any child in grades K-8 who can safely swim one length of a 25m pool. If you are unsure of your child’s ability or interest, we welcome you to attend the first few practices for a “test drive.” If you would like to test out our team, please email Rebecca Weimer (weimerclan@gmail.com). The team practices twice a week for one hour each session. The first three weeks the practice days vary due to pool availability. By October most practice are on Tuesdays and Fridays. SSPP will practice at Maryvale High School and Villa Maria College. We encourage children to attend as many practices as possible. However, we do understand it is an intense season and that families have many additional commitments. Children are never penalized for missed practices. A complete schedule is provided below. 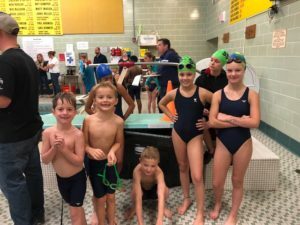 SSPP participates in the Neumann Catholic Swim League (www.ncsl-buffalo.org). We swim against other Catholic and private schools. There are 6 meets all held on Sunday mornings at various local pools. Meets last approximately 2.5 hours and all children participate in at least 3 events. There is an optional championship for all schools held at UB on November 13th. The league schedule has not been released, but the first meet will be on September 18th. Children may wear any swim suit to swim practice (no bikinis). Our team suits are navy blue. You may purchase a navy blue suit at any store of your choice. For your convenience, a representative from Laux’s Sporting Goods will be at our practice on September 8th. You can have your child measured and purchase a suit and goggles at this time. 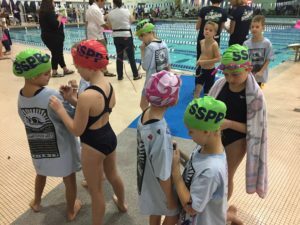 Swim caps are provided by SSPP. Girls are required to wear caps (it is optional for boys). Our swim practices are held at Maryvale High School and at Villa Maria College. There must be 2 certified, CPR trained lifeguards at every practice. The Maryvale pool is larger, so when practices are held at this pool the whole team will practice at the same time. 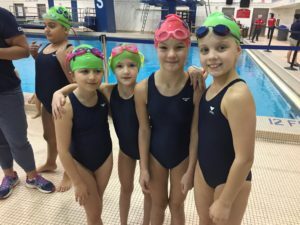 When the practice is at Villa Maria College, the 8 and under swimmers will practice for the first hour and the 9/10 and 11 & older will practice during the second hour.